Double-tracking is a well-used and effective studio recording technique, but getting it right isn’t always easy. Step forward MeldaProduction’s MDoubleTracker, a new plugin that works by varying pitch and delays in the left and right channels to make your sound bigger and wider. 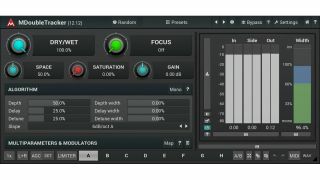 MDoubleTracker uses the same techniques as many other stereo expanders and effects processors – including the Eventide H3000 - but promises improved implementation and additional creative features. In keeping with other MeldaProduction products you get 16x upsampling, M/S and surround support, automatic gain compensation and more. MDoubleTracker is included in three existing collections - MMixingFXBundle, MTotalFXBundle and MCompleteBundle - and also available on its own for the introductory price of €25 (regular price will be €79). It runs on PC and Mac in VST/AU/AAX formats and there’s a demo for you to try. Find out more on the MeldaProduction website.